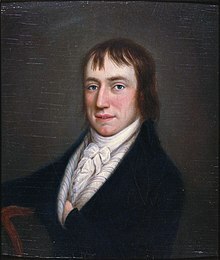 William Wordsworth (April 7, 1770 – April 23, 1850) was a major English poet who, with Samuel Taylor Coleridge, launched the Romantic Age in English literature with the 1798 publication of Lyrical Ballads. Here will I live, of all but heaven disowned. My Heart Leaps Up When I Behold, (1802); the last three lines of this form the introductory lines of the long Ode: Intimations of Immortality from Recollections of Early Childhood begun the next day. Who on that day the word of onset gave! When they lie about our feet. Loose types of things through all degrees. Festively she puts forth in trim array. The gentleness of heaven broods o'er the Sea. Powers that will work for thee,—air, earth, and skies! One of the mountains; each a mighty Voice. Surprised by joy—impatient as the Wind. These feeble and fastidious times. Left upon a Seat in a Yew-tree, which stands near the Lake of Esthwaile, on a desolate part of the Shore, commanding a beautiful Prospect. No common soul. In youth by science nursed. He died,—this seat his only monument. Unlawful, ever. O be wiser, thou ! Against the wind and open sky! Poetry...takes its origin from emotion recollected in tranquility. But, whenever a portion of this facility we may suppose even the greatest Poet to possess, there cannot be a doubt that the language which it will suggest of him, must, in liveliness and truth, fall far short of that with is uttered by men in real life, under the actual pressure of these passions, certain shadows of which the poet thus produced, or feels to be produced, in himself. However exalted a notion we would wish to cherish of the character of a Poet, it is obvious, that, while he describes and imitates passions, his situation is altogether slavish and mechanical, compared with the freedom and power of real and substantial action and suffering. A Lady of my own." And its forlorn Hic jacet! Text from the 1850 edition, unless otherwise stated. Spent in a round of strenuous idleness. A kind of heavenly destiny. As more exposed to suffering and distress. And moveth all together, if it moves at all. And though his favorite seat be feeble woman's breast. The past unsighed for, and the future sure. And fields invested with purpureal gleams. Is breathed upon by Hope’s perpetual breath. Or surely you 'll grow double! Up! up! my friend, and clear your looks! Or reap an acre of his neighbor's corn. That has been, and may be again. Maidens withering on the stalk. Earth helped him with the cry of blood. A subject, not a slave! Of music, audible to him alone. Be wise to-day; 'tis madness to defer. What we need is not the will to believe, but the wish to find out, which is its exact opposite. The languid way in which he gives you a handful of numb unresponsive fingers is very significant. It seems also rather to grieve him that you have any admiration for anybody but him. No man that I ever met has give me less, has disappointed me less. My peace be with him, and a happy evening to his, on the whole, respectable life. Unread his works – his "Milk-white Doe"
I needed to be made to feel that there was real, permanent happiness in tranquil contemplation. Wordsworth taught me this, not only without turning away from, but with a greatly increased interest in, the common feelings and common destiny of human beings. Have learned and re-learned to forget and forget again. Knew that eternity flows in a mountain beck. He wasn't a man as was thowte a deal o' for his potry when he was hereabout. It hed no laugh in it same as Lile Hartley [Coleridge]'s, bided a deal o makkin I darsay. It was kept oer long in his heead mappen. But then for aw that, he had best eye to mountains and streams, and buildings in the daale, notished ivvry stean o' the fellside, and we nin on us durst bang a bowder stean a bit or cut a bit coppy or raase an old wa' doon when he was astir. In his youth Wordsworth sympathized with the French Revolution, went to France, wrote good poetry, and had a natural daughter. At this period he was called a "bad" man. Then he became "good", abandoned his daughter, adopted correct principles, and wrote bad poetry. What a beastly and pitiful wretch that Wordsworth! That such a man should be such a poet! I can compare him with no one but Simonides, that flatterer of the Sicilian tyrants, and at the same time the most natural and tender of lyric poets.